Bet to follow at Bath. May play again after this race. Well two ill-advised tennis match bets - both selections going down comfortably in straight sets. NI La looked good and remains 14/1 to win the title which looks reasonable value as she is in the opposite half of the draw to Serena. Li would not meet Pova until the semi-final. I backed the Chinese in January at today's price! 7/1 to reach the final looks value. Interesting match coming up after the Tsonga match. Laura Robson versus Caroline Wozniacki. I couldn't believe it when the bookmakers opened with Laura around 4/6 favourite to beat the former number one. The market has now moved the other way however and Woza is 4/5 favourite to beat the British number one as the match approaches. I won't be betting on the match but it should be an intriguing affair. Despite the choice of horse racing fixtures today I don't plan to have a horse bet. I am though having a couple of small wagers on tennis matches taking place this morning. The first is against my long-term pick for the ladies' title Li Na. 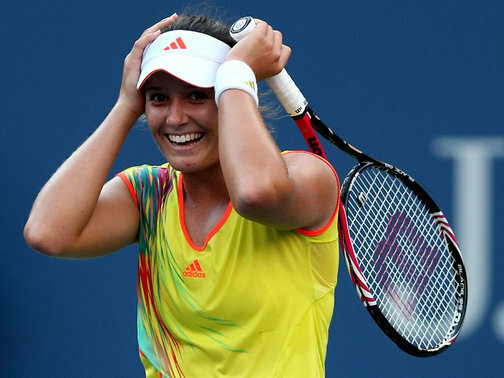 She has not played well recently with defeats to Madison Keys and Jankovic. What's more today's opponent is not a great match-up. Medina Garrigues holds a 3-1 HTH over the Chinese and that single loss was a retirement. The Spanish player had a seesaw match with SW in Madrid recently taking the middle set 6-0! Peer is 3-4 HTH but has won both encounters on clay. Both matches are scheduled for a 10am start. One will be shown on ITV, the other on ITV4. Berdych has a potentially tricky first round against Mon Fils but he has been playing really well this season and looks the danger to DF winning this quarter. Should be some good viewing over the next fortnight. It's a good idea to have the latter bet with Fred because if Monaco wins the tourney without dropping a set you'll be paid at 900/1! Far more likely to be dispatched in the first round of course. Total 1.75pts. Some thoughts on the third quarter later today. Saw Christy Moore at Hay Festival yesterday for the second time. He reminded the audience that it was Bob Dylan's 72nd birthday before singing, "I Pity The Poor Immigrant". In the tennis Nadal v Djoko is the projected semi and as predicted the 1/2 odds ew betting has disappeared. Federer and Ferrer have been cut for the title. More on the tennis later. Off to Hay Festival tomorrow. When I was there last year there didn't seem to be much wi-fi about so it may be a bit difficult for me to place bets and, of course, write my thoughts on the blog. I may have a couple of small bets at Haydock and Goodwood first thing in the morning before I set off. They will be small though, following the lack of success at these two gaffs today. The French Open draws will be announced mid-morning which is horribly inconvenient as I won't be able to scramble about for the best prices. However one cannot be a slave to this game and a serious injection of culture can only be a good thing. Looking forward to various events including music from Rokia Traore and then Christy Moore who I saw a few years ago at the Hay gig. Meanwhile I have just had another small bet in the ladies' French Open tournament on a player who has played ok here in the past and what's more has shown a return to form in recent weeks. 0.75pts ew Jelena Jankovic to win French Open ladies' singles @ 100/1 William Hill (1/2 odds 1,2). VC have cut Ferrer from 33s to 25s. Boylesports have lengthened Ferrer from 28/1 to 33/1. There is a catch with the latter however as they have reduced their place terms to 1/3. So it's now 11/1 instead of 14/1 with Boyles for the place part of the recommended bet. Best ew price for Ferrer right now is with nosporting bet - 40/1 (1/3 1,2). Djoko 1 v Ferrer 4 and Nadal 3 v Federer 2 No other combinations. Nadal and Djoko represent over 90% of the win market - 4/6 and 2/1. There is a 50% chance that they could end up in the same half after the seedings and draws are announced on Friday. If this happens you can forecast a radical change to the market and all the 1/2 odds ew betting would possibly disappear. There are very few negatives about the top two players - Rafa has not played five sets since his return from injury. Djoko has a niggling ankle injury which could take some punishment over five sets for two weeks. In any event I have had a small top up on Federer hoping for the dream Djoko v Nadal projection on Friday!! With Andy Murray's withdrawal there is an each-way bet to be had. We have been told by the French authorities that the seedings will follow the world rankings and that Rafa will receive no special treatment. Hence the top four seeds should now be announced as: 1 Djoko, 2 Federer, 3 Rafa, 4 Ferrer. Consequently, at this stage, (and with no further top four withdrawals) the only player guaranteed not to meet Rafa before the final is Ferrer. Given that Rafa is generally a 4/6 chance, being able to back a player ew at a decent price (who is guaranteed to be in the other half of the draw) is an opportunity not to be missed. The downside of backing Ferrer is his poor record against the top players. Obviously if the above players reach their seeded positions in the draw, Ferrer will either play Djoko (5-10 HTH deficit but 3-1 ahead on clay) or Federer (disastrous 0-14 HTH) in the semi-final. We already have a small ew bet on Federer at 14/1 (now bigger) placed in February so that would get us our money back if they were to meet in the last four and Federer won for the fifteenth time. If you can get on with non-layer Victor then do so as he is offering 33/1 Ferrer. Do not bet with nosportingbet at their 40/1, however, as they only offer 1/3 odds 1,2. So the odds to reach the final are better with both Boyles and Victor. Newcastle bets, if any, will be posted after the first or possibly the second race has been run there. Federer played really poorly against Rafa yesterday and after two games it was clear he was not going to have a chance. Both favourites for the French Open (Rafa and SW) look really strong and it will not be worth having any further bets until the draws are known. Even then it may not be worth playing. No horse racing bets today. Federer plays the King Of Clay at 3pm UK time tomorrow. We have a chance - although Fed can be backed at 7/2 and I was expecting him to be a little shorter than that. Still it should be an enjoyable view and we have a decent bet to nothing. So total stakes on Rome ATP will be 17. If Paire wins today then the overall profit will be four. If Federer wins the match it will be a modest profit of 2.5pts but we will have a free hit on the final which would produce 36pts profit should Federer beat Nadal (or Berdych). He won't be much more than 2/1 if as expected he plays Nadal on Sunday. Just now catching up with Friday's results. There was a fair start at Hamilton with (second choice) Coral Sands winning again, this time at a generous 7/1 (BOG). No gain on the rest of the card though with just Bronze Beau making the frame at 14/1 (BOG). All this means just a marginal profit of 0.75pts on the day's horses! In Rome we just have Federer in the semis - 3pts ew 11/1. However we have laid out 14pts on the ew Rome strategy and there is a chance of coming away with nothing because Paire has ripped through the other bottom-half quarter, taking out my fancies Monaco and Del Potro. The (place) return for Fed is potentially 19.5pts for a modest 5.5pts profit on the tournament but with a further potential return of 36pts should he win the tournament. I am going to have to reinvest a chunk of that 5.5pts on Paire beating Fed and will look for the best strategy in the morning. With regard to the horses, a couple of races at Thirsk and Doncaster will also need attention tomorrow. Eight points staked. Play starts in the men's matches in about 40 minutes time. Elsewhere no recent news on Mourhino taking over again at Chelsea. You probably know that you can lay him at around 1/5 (just laid him for a few quid at 1.21) on betfair. This is not a specific recommendation but if you have the 16/1 about him going back to Stamford Bridge you might like to at least save your stake. 2.5pts staked more to follow. Some support for the first selection. No further bets until around 14:30 today. Kept on the right side today with the Head Turner obliging on Noble Gift at 10/1 (SP only 5/1). Hopefully, if you played the ew selections in the Victoria Cup, you took my advice and bet with a bookmaker who offered the first five places. If you didn't you will not have a return as Dream Tune, having run all over the track, finally ended up in fifth place to reward (some) each-way backers. Today was a good illustration of the need to obtain the best prices and concessions available. Without that fifth place it would have been a losing day. As it was a small profit on the day was achieved. No bets tomorrow so the next action likely to be on Monday. 15:50A 6 x 0.25pt combination forecast Solar Diety, Dream Tune, Elusive Flame, Fast Finian total 1.5 pts staked with William Hill. A total of 12.5 points staked on the day so far. And one in the last at Ascot that Rocket Rob might be backing perhaps? A busy day yesterday with 22.5 points staked across five meetings. Thanks to Yeeoow winning at 8/1 at Ascot plus a placed horse I came out with a profit of around five points. Could have been much better though as we had two narrow runner-ups at 10/1 and 5/1. There was a big distraction in the evening with the start of the Ludlow Spring (beer) Festival when I was forced to choose from the 180 beers on offer! Make sure you bet on this race with one of the firms that offers fist five. Missed the gamble on this one but it may drift out at post time so BOG essential. That's the only other race this afternoon. Other bets will be at this evening's meetings. After a poor day yesterday back with a bang today (to relatively modest stakes unfortunately!). Two races: two winners. Aye Aye Digby obliges at 13/2 (SP 6/1) and then shortly afterwards Effie B wins at 20/1 (a Rule4 deduction means our price was reduced to 16/1). SP just 12/1. Profit on the day 39.5 points. It's 7/1 with Boylesport and nosportingbet but that price is without the BOG insurance. No luck in the Chester race, main selection more or less left in the stalls. With regard to the tennis, VC has also put up 33/1 Dimitrov for Madrid this morning but significantly go 1/2 odds to reach the final, so have your outright Madrid bets there if the prices are comparable and of course you have an open account. I watched an extraordinary match tonight: Dimitrov beating Djokovic in three sets. The young Bulgarian played some incredible stuff to beat the world number one. The match lasted over three hours with the underdog cramping badly at the end of the second set. He recovered to take the third set in what was an incident packed match. With any luck the forecast overnight rain will not change the ground conditions too much. Only a couple of points down on the day despite a large outlay and no winners. Places at 22/1 and 20/1 (BOG) rewarded the ew bets. The best chance of a winner was Blue Noodles which went down by a short-head to the Head Turner. SP was an incredible 11/2 so somewhat unfortunate result. But I guess when one is backing mainly in sprint handicaps the margins are going to be small a lot of the time. Laura takes out world no4 with some ease at the Madrid Open yesterday. Obviously getting ready to land our 200/1 Wimbledon poke! (Now best price 80/1). Unfortunately have dropped 11.5 points today which has rather diminished the 70 point Saturday/Sunday horse racing profits. Further bets after 15:00 today. Weekend winners at 25/1, 7/1 and 2/1 for 70pts horse racing profit in two days. Why do I bother with football - or even worse snooker? Should be focusing solely on the flat tracks. Will be looking at Bath, Beveley and Kempton today. So far, I don't like anything! Well that was useful - Coral Sands obliging for us at 25/1! I like the name. be lucky! Any further bets today will be posted around 13:50 before I trap to tennis courts. No luck with the lower league play-offs with just one draw from the four matches. Probably one more race to follow. Stakes 13 points. Going to swerve the horses today and have a mug punter bet on the snooker. Ronnie, allegedly, doesn't want to be there and Trump is playing well winning the last three frames yesterday. I doubt whether the Rocket will enjoy today's 10:00am start so this morning's session could give Trump the opportunity to edge ahead. Here's hoping for two non-events tonight! Bet is really only of any value if you have had the 16/1 Chelsea, which is currently as low as a 1/8 chance. There are 52 Ludlow restaurants listed on Trip Advisor. The number one is my number one: The Green Cafe. But which others would I recommend? Eight points staked, Pontefract to follow.